Like any complex mechanical system, garage doors are made up of plenty of moving parts that can be potentially dangerous if they break down. Springs can snap, tracks can bend and possibly even tear, while the doors themselves are heavy enough to do some major damage, or cause a serious physical injury if it collapses. For these reasons, it is a good idea to brush up on your door’s safety etiquette because the only thing one needs to get hurt by their system is to be just a little too careless. Electricity is both extremely helpful and profoundly dangerous, something most people don’t truly understand until they get shocked. That is why, when it comes to electric garage doors, you need to make sure that the opener is properly sealed and that none of its electrical wires are exposed. If the wiring is a mess, it’s also good to remember that electricity does pose a fire hazard when not properly dealt with. The door opener itself is also made up with a few gears that grind together when the motor is running. These moving parts can pose a danger to any wondering fingers, snagging them, breaking them and possibly even maiming them, which is another reason to keep the opener motor properly covered. The same is also true for the tracks and ball bearings, which can give your finger more than just a tiny pinch if you are unlucky enough to get snagged by them. Garage doors are exceptionally heavy. Their main support comes from springs, which, although tough, are not invulnerable. But they're not alone. 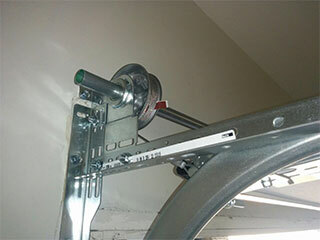 Safety cables are some of the most underrated parts of garage door systems, which makes them easy to overlook. Make sure you keep a close eye on the condition of these components to ensure that they will keep doing what they are supposed to - carry the weight of your door. As long as none are broken or worn-down, the weight of your door gets distributed between these components, and none of them ends up straining needlessly. The best and safest way to handle every type of garage door related problem is a simple one - call for help. The risks involved in dealing with these complex systems make any mishandling potentially very dangerous. That's why any repair or replacement work must only be conducted by a professional technician. Contact our experts at Garage Door Repair Irvine whenever you find yourself in need of professional help.